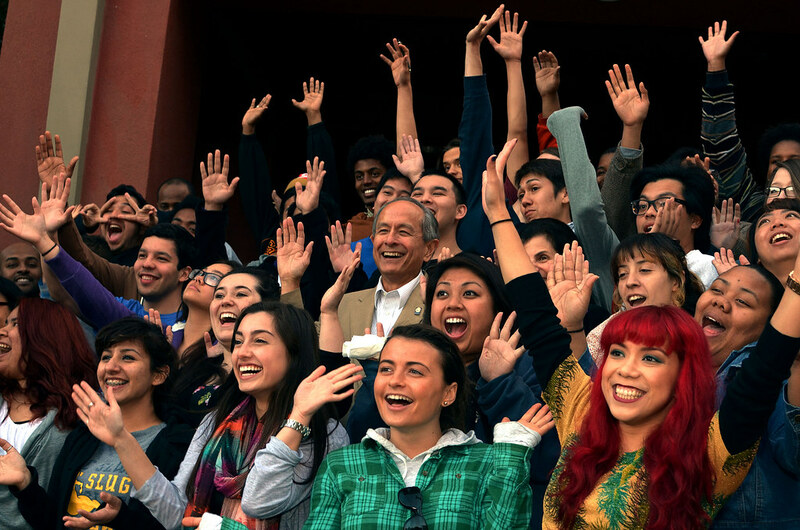 For the first time in nearly a quarter century, SF State will observe the establishing of a new president. Celebrating “new momentum for a new era” and the investiture of President Les Wong, SF State will host a series of events March 9 to 15 under the slogan: XLR8 @ SF State. Investiture is the term used to describe the inauguration, or act, of establishing a new authority into office. The investiture ceremony for President Wong will occur March 14, but SF State is extending the festivities to include a weeks worth of activities aimed at engaging the public and highlighting past and future accomplishments. Among the events planned are a 5K campus lap, student dance, community service day and multiple receptions aimed at students and the University’s extended community. Students and a presidential investiture planning committee organized the weeks worth of events, underwritten by $120,000 from private sponsors so as to not tap into any state-financed resources. The Student Life at SF State Facebook page started several pages for some XLR8 events, including the investiture ceremony, Noise Complaint dance, 5k and community service day. Regardless of the social media campaign and advertisement in the last issue of Xpress for the XLR8 events, some students are not aware of the student-focused activities. Jenessa Ponco, an 18-year-old marketing student, said she was not aware of the investiture events like the dance or 5K. “I just know that he (President Wong) did the Harlem Shake,” Ponco said. The administration is hopeful, however, that there will be a good turnout for some of the events. Nava says they expect about 70 students at the 5K event, with a team being led by President Wong himself. Kicking off the week-long celebration in Malcolm X Plaza, March 9 at 8 a.m., is “One Community,” a community service focused event co-operated by the school and the Department of Public Works. Mayor Ed Lee and Supervisor Norman Yee are expected to speak regarding sustainability efforts on-and-off campus, as well as a related eco-fair. The school will oversee various service projects at SF State and throughout District 7 that day, including planting trees, weeding, and graffiti abatement, according to the XLR8 website. A lunch is planned for all who participate. The administration is hoping for a large student presence at President Wong’s investiture ceremony March 14 at McKenna Hall. Noise Complaint, a student dance party, will cap the entire week of festivities on March 15 at 10 p.m. and go until 1:30 a.m. President and Mrs. Wong will be present to socialize and interact with attending students. The event is strictly for SF State students and their guests, for which Nava stressed there will be a tight screening. The full list of event times, details and RSVPs can be seen at the XLR8 @ SF State website. SF State: You have an absolute winner in the Wongs. They are truly the ‘real thing’. Dr. Wong was a great President at Northern Michigan University and will be sadly missed.